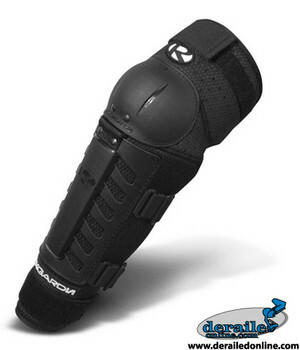 The holy grail of body armor is a knee/shin guard that both fits well and doesn�t move around. Unfortunately, we are not all built the same, posing a monstrous challenge to armor manufacturers � how to make a knee shin guard that fits everyone but yet does not move around. By now, we have seen everything imaginable when it comes to shin guard design. There have been designs that incorporated sleeves, knee socks, a gazillion straps, straps in different directions, ratcheting straps, criss-cross straps, you name it... In the end, you have to make some sacrifices to get what you as a rider want. When you cut to the chase it is all about what you like. Rockgardn has an entire line of protective equipment. 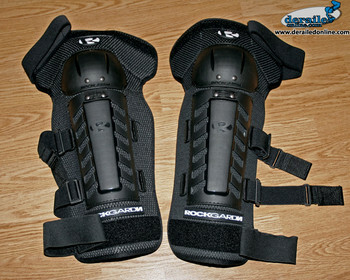 Two of their longest running pieces of equipment they offer are knee/shin guards and upper body armor. The upper body armor has been popular and their knee/shin armor has been equally good. If you remember, in the past we have reviewed Rockgardn�s Landing Zone line of body armor and we gave it a very respectable review � and that leg armor is still going strong till this day. 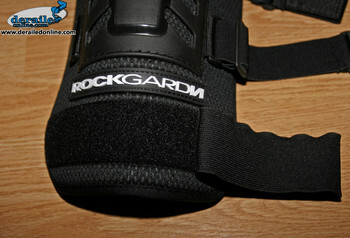 Now we have the latest rendition of Rockgardn�s Landing Zone knee/shin armor. Why do we like this armor more than their other offerings? It comes back to the personal preference statement made before; the Landing Zone armor is designed how we like knee/shin armor. The Landing Zone guards uses no sock and your shoes don�t play a part in putting this armor on or off. 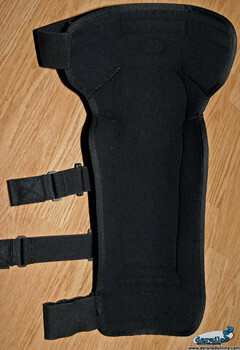 It uses a set of straps to hold the guards in place rather than a sleeve or leg sock. The benefits of this design are, of course, ease of use but also the ability to loosen the straps to aid in cooling while you are not riding. The previous Landing Zone guards offered very good protection and a reliable construction. These new guards offer the same and more. The 2007 Landing Zone guards offer a new strap system which adds an additional strap at your ankle. The calf straps now have a method of keeping your adjustments between uses - a set and forget design. The design of the straps allows you to set the adjustments where you like on the straps and not have to re-adjust them when taking them on and off. This saves time and the guesswork of if you�ve got your straps tight or not. The straps consist of a small Velcro closure that holds the straps together while connected to another plastic ring through which adjustments are made using the adjusting buckle. The new guard offers the same nearly-wrap around protection as their previous guards. New for this year are improved knee cups and shin plates. The knee cups are now reinforced with a honey comb-like pattern molded into the back of each cup to strengthen the area where most knee/shin guards fail � something we have not seen on any other knee shin guard to date. The new shin plates also use this type of reinforcement behind the plate. The new strength added to the shin plate because of this has allowed Rockgardn to incorporate some vent holes in the shin plate without sacrificing strength. One thing to note about these knee/shin guards is that they do require some period of break in to make them mold well to your legs. After that the fit of the guards are very good and comfortable. The inner lining (Image 3.) of the guards is a soft material that feels very nice against your leg with no noticeable chafing. 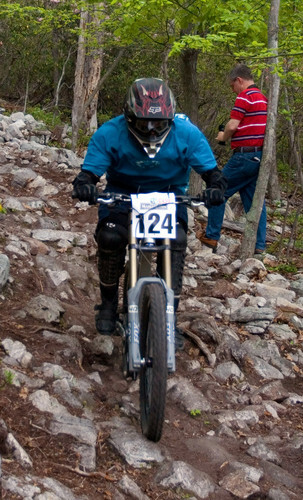 Rockgardn has succeeded again in doing a very good job of designing a knee/shin guard for the person that doesn�t want to sacrifice protection in order to feel comfortable while riding. You can purchase these guards online here. Posted on Jun 26, 2007 16:35:32 -0400 by Brady.